It was suggested in my 6CI engine post that I post my shaper restoration here. I was having trouble finding a sub in this forum where I thought it would fit, and felt like it would be white noise on other sites. So, here we go. Like many others, a while back, I started seeing some people using shapers, and became infatuated. I finally found one at a price point that made sense, and the pictures will follow to help me tell the story. Was looking at the pictures of it on the other thread - is it a model of a shaper, or just a small one? I am another glad that you are posting here and who will be following along. Interested to learn more about shapers, but also interested in following the restoration techniques as I am sure many would be applicable to all sorts of machine restoration or even normal maintenance. Let me just start by saying you guys are all so awesome. Also, I consider myself to be a very enthusiastic novice. I learn from others, and then try it out. The machine is not a model. It is a "full size" Atlas 7B. That being said, these are considered small shapers, and that is why they have become so popular. A guy can fit this in his garage, and also have other tools. The 7 refers to the length of travel of the ram. More typical shapers would be maybe 16", and MUCH heavier. Also, please feel free to let me know if you'd prefer to have more or less explanation, pictures, etc. I'm putting this together the way it occurs to me, but my primary objective is putting something out there that others find useful and/or interesting. With that, here goes. On 10/11/18, I stopped by my local Fastenal to pick up this shaper I purchased from the East Coast. Doesn't it look cozy in the back of my little Subaru?! It's a bit rusty, and as I found out, it was rusted immobile! I removed the inspection plate to have a look inside, and see if I could get any motion out of the ram. No such luck. At this point I am buzzing with anticipation, and I can barely contain myself. I just have to do SOMETHING to this machine right away! Just look at all that beautiful filth. Later I would decide there was a second paint job applied to the machine over the top of the original. Here you can see the original color seemed to be a standard machine gray. At this point, it is still my intention to just get this machine "cleaned up" and ready for operation which won't degrade bearings, etc. Later, my ambitions would change drastically. At this point, I've removed the tool post, clapper and swivel assembly, knee, feed and ratchet cover. Those were relatively quick and easy. Here you can see that the motor, and bracket has already been removed. I decided to focus on getting the ram loose, and I would learn that this was much more involved than initially suspected. In order to separate the ram, I learned that the ram block, lever, and link had to remain connected initially. Here is that whole assembly removed. Certainly many others will not be impressed, but I was happy when it didn't take me long to come up with this solution to not having any tool around intended for this part. Naturally, it was important that the size of the hex keys was a fairly tight fit. However, this part, and it's cousin on the other side both turned relatively easily, so that also made me very happy! Here I'm using my longest bent flat blade screwdriver to persuade something internal. This shot gives a decent idea of just how cramped is my workspace. Here is that cousin part. Due to the shaft sticking out, I had to make an adjustment. If memory serves, I just used a wide blade screwdriver or something to get the twisting effect needed. Nice find, I am sure you will not be disappointed when it is finished. I went through the same exercise with mine a while ago, just be warned that finding an original vice will be a challenge. That is a beauty. I like how you did not paint the pot metal covers. I may ask advice on how you finished those out. I'm considering also not painting the aluminum belt guards, but we'll just have to see. I've seen plenty of discussion on paint, and it seems the consensus on forums is alkyd enamel. However, when I talked with somebody at Sherwin Williams, he has pretty much talked me into a standard oil base enamel. The size of container necessary, and overall cost to get into alkyd enamel was a bit off the charts. What did you choose for paint? I can see that you do actually use your machine. Oh, also, I've already seen what an insane price an original vice brings. I'm not concerned about that. I'm willing to simply use the one I purchased for use on my Burke milling machine. Alright friends, I've uploaded a video to youtube for your entertainment. I clearly didn't plan well, as it is not 16x9, but this was the day I brought home the shaper. The pictures I had received were not great, so there was some mystery. Also, if you can get through the video, you'll learn that I had a little different idea about the shaper when I first got it home. Constructive criticism is welcome. I've got other videos too, but they probably are all just as terrible as this one. I'd like to put together a decent video of the assembly at least. Along the way, I decided I would chase all the threads, and fortunately the old machine used all standard sizes, so I already had taps and dies the correct size. Later I'll realize that citristrip found its way into those clean threads, and I'll have to redo some of the work, but I think I might do it the same way again. At this point, I'm really just dipping my toes in the water, and I wanted to see how well the badges would clean up. Not too bad, actually! There's still some grime around the "rivets" there, but it's all coming off, so I'll finish the work later. At least I can see how good it can look. Most of the threads were in very good condition like the ones you see here. The die was almost more of a pre-degreaser preparation step. Look at all the crud jammed up in it. I tend to obsess a bit. Those who know me can get off the floor now at the understatement just made. See how you can tell that the knee runner only ever used the one side of the base? If you look at the operation of the machine, the knee slides from side to side as the ram cuts progress. I've got a friend with a shop, and you see this same sort of thing there. People who didn't buy the machine don't tend to worry about keeping things clean. While I'm using this machine, it won't be so obvious if I don't really use the left side of the base! Here, you get a view of some of the most challenging disassembly I experienced with this machine. That large gear is the crank gear, and it connects through to the S7-58 shaft, and hub assembly. First, the 6 enormous phillips screws holding plates to the crank gear are larger than the largest size driver I could find. If memory serves, I believe it was a #4. However, with patience, a rigid setup, and care, I was able to get them loose without bunging them up! However, that wasn't all. I also found challenge with removing the S7-83A shaft you see holding the much smaller gear in that picture. Once I got the crank gear and the shaft removed, I struggled mightily with figuring out how to get the S7-58 shaft out of the hub, and removing the hub from the side of the frame. Ultimately, it took a great deal of force, and I could find no way of pressing it through, so I had to rely on impact. The result of this is that the small section of thread which you do not see from the outside of the machine is bent. I still haven't decided whether I'll be able to heat, and straighten the existing part, or if I'll have to make a new one. Here is a better look at the phillips screws. Not only are they huge, but they were peened in place too. With those plates out of the way, I feel I'll get this gear removed soon. Here you can see me removing the block and pin from the crank gear assembly. The position of this pin relative to the center of the crank gear is what determines the "throw" of the ram, or how far it will travel with each stroke. 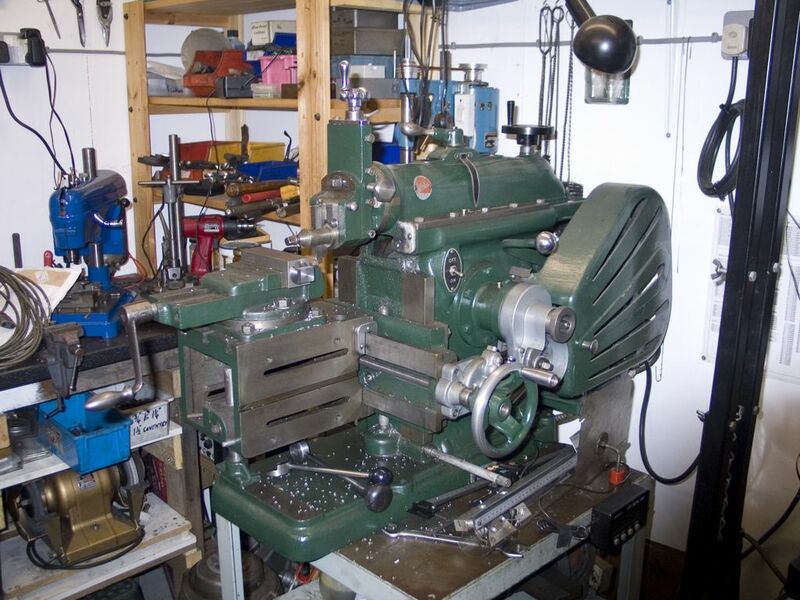 Early into this process, it struck me just how much more complex of a machine a shaper is than a lathe. Four cap head screws later, and I'll be able to get this crank gear out of here. You can see the bronze "nut" with the cylindrical protrusion flopped over. The traveling of this "nut" on those threads is what slides the block and pin further from, or closer to the center of the crank gear, thus adjusting the throw of the ram. There, the gear is removed, and I'm left with the S7-13A hub with bearing cone, and S7-58 shaft. It should be a simple matter of removing that little helical gear from the end of the shaft, and everything will just cooperate, right?! Absolutely not! Here is where I employed every four letter word I have ever practiced over my considerable years of experience, and also some mechanical efforts. Nothing was working. It took me quite a while, some penetrating oil, and a whole lot of visual inspection, and internet research before I started getting a bit heavy handed with the process. One thing is that these little helical gears (of which there are several on the machine) do not like being removed from their shafts. However, this one was especially stubborn. Here is where I also learned how unreasonable people can get when others ask online about how to disassemble even a particular aspect of these machines. From my world, when learning Linux, it was akin to "RTFM!!" Since there are exploded diagrams out there, you should apparently never ask anybody how to disassemble any part of the machine. Well, the exploded diagram doesn't tell everything. Here is that stubborn little shaft, and you can see some varnish? on it. It was good and stuck. If you look closely, you'll also notice that short section of threads at the top are bent. I don't think the part would be difficult to turn, but threads are still a bit of a challenge for me. I don't have very many of my change gears, and I tend to have all the wrong sized taps and dies most of the time. These are very fine threads. We'll see! If memory serves, I believe it took me quite a while to decide this "collar" is actually threaded. I think it may have been somewhat challenging. However, relatively speaking, no biggie at this point in the game! After removing the collar and gear in the previous picture, the hub assembly was able to be gently persuaded to leave its home! As usual, I took the time to see that all the threads were going to be in good shape when assembly day came later on. Other than a few missing screws, and a couple of screws broken off in the machine, I was very fortunate with all the screws being in relatively good shape. Here we have the flange assembly finally being removed from the frame. This relatively short period of time was so transformative to my mindset about the project. I had really been struggling a while there. This picture also presents a wonderful opportunity to illustrate another issue with the machine. It came with no switch, switch cover, nor wiring. I'll have to come up with that stuff myself. I believe I can get a decent home made switch cover, and surely I can find an appropriate looking, and sized switch. Wiring is no big deal. That may even actually be fun! Well this phase of the restoration is certainly moving along rapidly!! Thanks for posting the progress and all the pictures. Alright all, this is going to be a bit out of order, but I just got in my maroon scotchbrite wheel the other day, and had a few minutes to see some results last night. This is a wheel with nothing more than having been removed from the machine, and degreased. Here is that same wheel with just a quick pass against the wheel. I am so impressed with these results. Here are some other items, with a untouched bolt for reference. That little handle leaves me wondering if it may just have a coat on it, so I didn't leave it against the wheel very long. I'll worry about that later. Check out that grease cup! Soon I'll be posting an image of what it looked like straight off the machine. It wasn't horrible, but this is a marked improvement! That really made a huge difference...those look great now!! Stepping back in time again, I've got most of the major items dismantled, and it's time to start breaking down everything into even smaller pieces! I made sure to get a picture of all the parts together so that later I would have an easier time identifying which parts go with which other parts. There are actually a LOT of little parts, and there are some that are very similar, but slightly different sizes. This is the disc and gear, and it was fairly well locked up with grime. It went directly into a degreaser bath. Here is all of that hardware after degreasing. Just today I pulled out each of these parts and buffed them on the scotchbrite wheel. They had a bit of rust here and there, and looked much worse than this picture depicts. I am so over the moon about the results of the scrotchbrite wheel. Just look at all that grime and peeling paint. I can clearly remember this moment. I started giving some real thought to a "full restoration." As I started to realize just how much effort there was going to be in getting this machine apart enough to do a proper "clean up" I knew I would never want to do it again. So, I was either going to do the restoration now, or never. The shaft on the runner was so completely locked into the knee, I literally wound up having to use this arm puller to get it out. I knew if I didn't take the oiler out of the stud in the ram right away, it would be broken soon enough. Here, I was finally able to remove the block, ram lever, and link from the ram. All together, that thing was unwieldy. This assembly up in the ram would wind up being one of the very most difficult things to disassemble. Hopefully my pictures are good enough that I can put some words together later to describe what it took. This had some sort of split pin holding the gear on the shaft. That part wasn't too bad. It's the gear under this one that was so darned challenging. I don't believe it was difficult to notice, but here is a grub screw that holds the ram lever to the link. That wasn't shown in the "Parts List Catalog" exploded diagram I have. Regardless of the color on that pin, it's actually pretty smooth. It will clean up quite nicely. Of course, there's a grub screw at this end of the ram lever too. This grub screw was obvious enough. This is the other side of that gear inside the ram I mentioned earlier. It seems like this would just be simple, right? I made all sorts of effort to thread off the collar from the shaft, and when that failed miserably, I made slowly increasing efforts to force it out with dead blow force. Ultimately it did come out with dead blow force, but I was very concerned about jacking up threads, so that took quite a while. In my exploded diagram, this is simply labeled as a shaft, some bearings, collars, gear, etc. I'll call it the main drive shaft assembly. I decided to leave it as an assembly, as I did not really see a benefit to taking it apart, but I did see plenty of possible detractions. Here we are after a nice degreaser bath. It's already looking a whole lot better, but there will be further efforts as I continue on. Despite the overall immobile nature of the machine, I found that most parts were not terribly worn, etc. However, this drive gear is an exception to that. There were some reasonable burrs thrown up on each tooth. So, I will address those before reassembly. One could easily argue that this is an image not worth sharing, but I did anyway. This is how I intend to be able to ensure that I don't wind up thinking "Now, where did this go?" during reassembly! It's also a pretty nice close-up of the rust/paint nastiness combo present on the machine. Just looking back at these now, I get even more excited at how wonderful each of the stripped parts look today. As I work with more machines, learn more about the machining process, and work toward some casting efforts, a part with some shape like this really stands out to me. I see so much beauty in it. I find it to be elegant. Look at those embossed letters. Later I will put a fair bit of effort into removing extra casting slag, and gunk from around those letters to they pop as well as possible once repainted. Let's have a nice look at that nasty base. There's really nothing wrong with the base, but it looks pretty unsavory, simply because so much nastiness fell there over the years, and maybe nobody ever thought about cleaning the machine. Here are a few more items pulled from the degreaser bath. If I had just been "cleaning up" the machine, I would have been quite happy with each of these parts at this stage. This is the cross rail with lift nut freshly removed. These old kitty litter tubs make excellent degreaser baths for many of the parts. Here is the magic. Just look at that foam. It was interesting seeing how quickly the bubbles discolored blackish. For the panel, I was able to simply use a punch from the back side of the panel. This won't be the case on the other badges. Degreasing large items is so very different than smaller hardware, especially threads. This was a very time consuming, and somewhat tedious task. This is another example of something there is no way I would be able to figure out later. In fact, the exploded diagram has NO MENTION of this grub screw. Also, that lock washer is unlike any other on the machine. These parts are post degreaser bath, and pre paint removal. No kidding. I haven't even broken out the citristrip yet! I've laid out all of the motor and belt drive, and engaging mechanisms with their associated pins, and grub screws in position for later referral, as I assemble everything. I've never before seen bearings like this. Look at that felt washer. There is no way I would have put this back together properly without this image. My "extra parts" bin would be full indeed! At this point, I've taken you all with me on a journey up to the point of paint removal. Overall, I feel like everything I've done up to this point has a relatively good process. The paint removal though, I could certainly improve that. There are so many variables involved. I'm in though. I'm already thinking about what machine I can restore next. Anybody got something they want to donate?! Until next time, keep having fun, and get in that shop!